Addition of a strong base to an alkyl halide results in elimination to form an alkene. Bimolecular elimination, abbreviated E2, is the reaction where alkyl halides react with nucleophiles that are also strong bases in the one-step mechanism. This is the most common mechanism for dehydrohalogenation. The rate of alkene formation depends on two substance (bimolecular) and it is proportional to the concentrations of both the starting halide and the base. As tertiary halides react with weak bases according to an E1 mechanism, both primary and secondary halides are subject to an E2 mechanism by reactions with strong bases. Strong bases (HO‾, RO‾) can attack alkyl halide before carbocation formation. 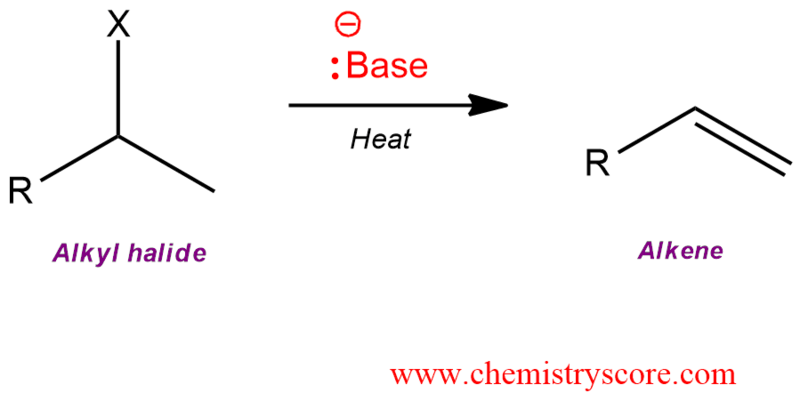 E2 is a concerted reaction where all bonds are broken and formed in a single step. This reaction begins with the deprotonation of the alkyl halide using the base. The target place is hydrogen on a carbon atom next to the one carrying the leaving group. Because two bonds are broken and two bonds are formed, so the transition state contains four partial bonds, with the negative charge shared over the base and the leaving group. The departure of the leaving group initiates rehybridization of the reacting carbon from sp³ to sp² to furnish the two p orbitals which form a double bond.